Baidu's financial earnings for the past five quarters. Chinese search giant, Baidu, reported a 34 per cent jump in profit for the second quarter, with mobile ad sales accounting for almost a third of revenue for the first time. Baidu's profit reached 3.5 billion yuan ($US571 million) for the quarter, while revenue soared 59 per cent to 12 billion yuan, at the upper end of its forecast. Mobile made up 30 per cent of revenue, which was a first for the company, CEO Robin Li said in a statement. A day earlier, Facebook said it more than doubled its profit in the second quarter, with mobile a big factor. The results show Baidu's profit engine moving back into high gear. Last year its earnings growth slowed as the company increased spending to develop and promote new products. 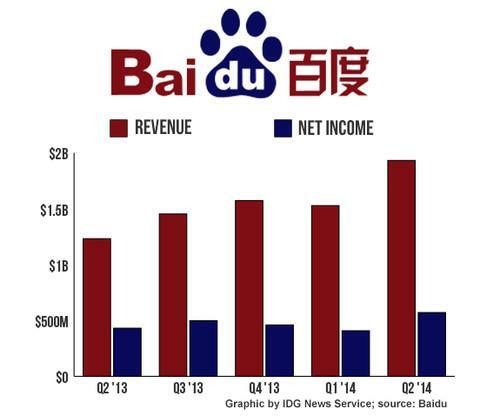 Since last year, Baidu has spent a lot more on research and development and on marketing. In the quarter just ended, R&D expenses increased 85 per cent year over year, while general and administrative expenses doubled. Most of that G&A increase was for promoting mobile products, it said. In the current quarter, Baidu expects revenue to reach as high as 13.8 billion yuan, an increase of 55 per cent from last year.